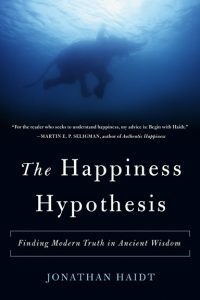 Chaplain Laurie Jordan will lead a bookgroup focusing on Jonathan Haidt’s The Happiness Hypothesis: Finding Modern Truth in Ancient Wisdom on Wednesday afternoons during J-term. The group will meet Jan. 18, 25, and Feb. 1 in the Scott Center living room at 4:30. Please let Laurie know (ljordan@middlebury.edu) if you’d like a copy of the book at a reduced rate of $5 per copy. Presented with funding from the Wellness Committee.